Chapter 7 and Chapter 13? With a Chapter 7 bankruptcy, the debtor will seek the elimination of outstanding debt. The elimination of debt in this case often calls for the debtor’s assets – minus personal belongings such as clothes and household necessities – to be gathered and sold so as to pay off the outstanding debt. A debtor’s house may even be included as an asset that the debtor must relinquish in order to pay off debt (although it is possible for Chapter 7 filers to keep their homes – create link). Conversely, in a Chapter 13 bankruptcy, the debtor is not seeking a discharge of his/her assets to pay off debt. Rather, the debtor seeks to arrange and agree to a “repayment plan” in order to retain assets. In this case, the debtor gets to keep his/her assets – including his/her home – as long as the repayment plan is followed. A Chapter 13 may take anywhere from 3 to 5 years. Conversely, a Chapter 7 takes approximately 90 days. Thus, the key difference between a Chapter 7 and a Chapter 13 is that in the former, the debtor’s assets (home typically included) are used to pay off debt, while in the latter, the debtor makes payments over time in order to keep his/her assets (home included). People often use Chapter 13 as a means of avoiding foreclosure. Bankruptcy Law requires that if a debtor has the means to file Chapter 13, then they must do so. You cannot file Chapter 7 unless you can show that your income, being below a set level, will not suffice for making Chapter 13 payments. Thus, which type a debtor files is largely determined by their particular situation. In any case, it is wise to consult with an experienced bankruptcy attorney if you are thinking about filing for Chapter 7 or Chapter 13. 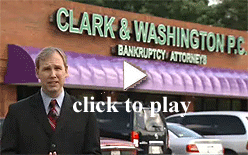 The attorneys here at Clark & Washington file over 500 bankruptcy cases each month and know the requirements of Chapter 7 and Chapter 13 bankruptcies. Presently, the court charges a fee for filing chapter 7 of $335.00. The court's filing fee for chapter 13 is $310.00. 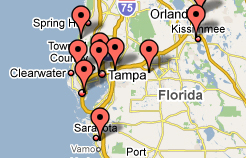 Call our office at (813) 345-5954 to set up a FREE consultation with one of our bankruptcy professionals.